Old Fashioned Homemade Chicken Soup – That’s what I’ll make for dinner – in the slow cooker of course. It’s going to be a very busy day today so early this morning I pulled out my trusty Rival® crock pot to lend a helping hand. I want dinner to be easy… require only a bare minimum of prep time and even less supervision. Old fashioned homemade chicken soup seems like the logical meal to make on this chilly winter day. Set of 2 Stoneware Soup BowlsSoup & Sandwiches For Dinner!With the exception of the chicken and some fresh celery, all the remaining ingredients were found in the fridge, in the vegetable basket and in the pantry. This is another case of cooking without a recipe – you know – grab this, finish that, and oh wait drop that in it too. I thought it was wise to write this version down immediately after dinner in case I ever want to make it again. 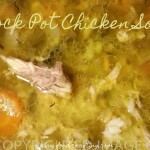 There are many variations of chicken soup made in the slow cooker. I’ve prepared chicken soup in record time with mixes (too salty), chicken pieces and even meat removed from a deli rotisserie chicken. Love soup? Take a quick look at all our soup recipes! But nothing is as tasty and satisfying as a soup made from plump, free-range, high-quality poultry, and fresh herbs. Speaking of Fresh Herbs & Spices! Using a whole fresh frying chicken and fresh herbs produces a deep rich stock which makes a world of flavor difference in the finished soup. 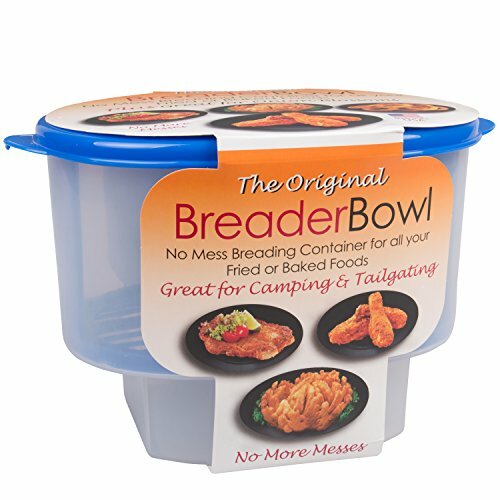 It’s a taste you simply cannot get with skinless pieces or precooked meat. All it takes is a little more time during the cooking process – time to remove the chicken from the broth and time to strain the broth to remove the tiny stems from the fresh thyme, sage, and parsley. Personally, I don’t mind the herbs but there are times when I’m in a hurry and all the fresh herbs are added to the soup as is. I’ll have to admit that large rosemary leaves are a little tough. Even the tiny thyme stems can get stringy. That’s when you reach for the herb infuser – a cute silicone drumstick – pack it full of fresh herbs and dunk it in the broth. Voilà! Give the chicken time to cool sufficiently so you can remove the meat, time to chop or shred the meat. It’s worth every extra minute! 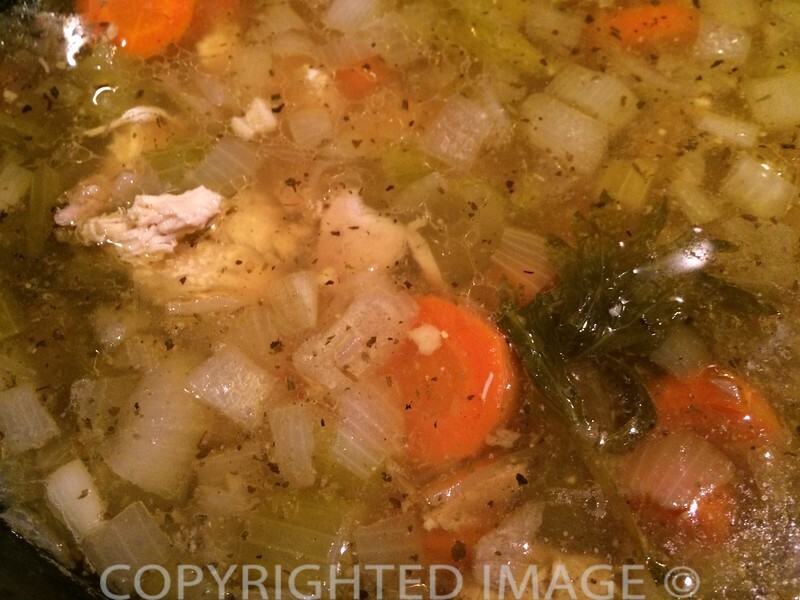 Serve up a big bowl of Old Fashioned Homemade Chicken Soup! What do you serve with a steaming bowl of chicken soup? In our house, when the soup is served as a first course, it comes with fresh warm rolls. How hard could it be to pop open a carton of Pillsbury Grands®? To make them a little less “ordinary”, I brushed them with soft garlic butter and sprinkled them with an Italian classic – shredded Parmigiano Reggiano. When the soup is the main event, I serve hearty sandwiches – always satisfying with a bowl of hot soup. A whole chicken, vegetables and rich broth. Melt the butter in a heavy pan and add the onions and celery. Sauté until the onions are translucent. Arrange half of the sautéed green vegetables on the bottom of the crock pot. Place whole chicken over the vegetables. Season to taste with salt and pepper. Place the rest of the vegetables around and over the chicken. Pour hot water over the chicken and vegetables. Add the herbs and bouillon cubes. Set the crock pot on HIGH for 4 hours. Cover and walk away. About 3 hours into the cooking time, check the chicken. Remove from the crock pot to a platter. Allow to cool so you can de-bone. Chop the meat into small pieces. Return to broth and vegetables. Adjust seasonings. Give yourself time to bake the rolls and dinner is ready! I used a 6 1/2 quart oval crockpot to make the soup. The chicken was just over 5 pounds. Along with the ingredients listed in this recipe, the crock pot was quite full – within an inch of the top. As a result, I did have to watch it carefully. I recommend a smaller chicken… say closer to 4 pounds than 5 pounds. 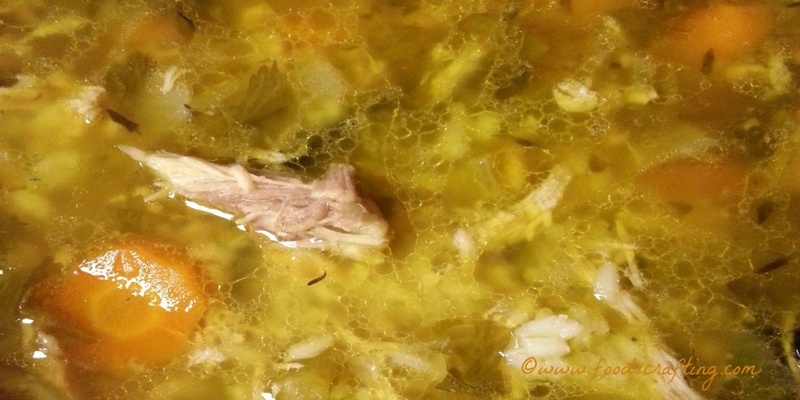 Add cooked rice or pasta for variations on the basic Chicken Soup. Kids would love alphabet pasta! You could add the raw rice or uncooked pasta to the crockpot during the last 30 minutes of cooking. However, both the rice and the pasta will “drink up” a considerable amount of your broth during the cooking process. To prevent this, I prepare rice/pasta on the stove top – separately from the soup. When ready to serve, add a portion of the rice (or pasta) to the bottom of the soup bowl and ladle the soup over the rice. Try long grain white rice, a wild rice combination, soup size pasta such as Stelline (the tiny stars), Ditalini or even orzo. Little did I know that nearly 300 miles away, my sister was also preparing soup – on the fly. No recipe. She sent me a photo. Needless to say, I asked for the recipe! Aha – Daughter is taking on my recipes! Her version of Mom’s Crock Pot Chicken Soup looks extra delicious. 2 Speaking of Fresh Herbs & Spices! It is tasty and perfect on a cold snowy day like today. May have to make soup again this weekend as we are promised another snow “event”. Be sure to send a photo and we’ll add it to the gallery. This looks tasty. Gonna make it this weekend. Thanks for posting. We are always on the go and have a tendency to get into a rut with meals. I love to try new recipes and this was quick, easy and homemade!! Thanks! I love making homemade soup and do it often, but don’t use my crockpot much. Gonna put this recipe on my to do list.